The No. 15 and No. 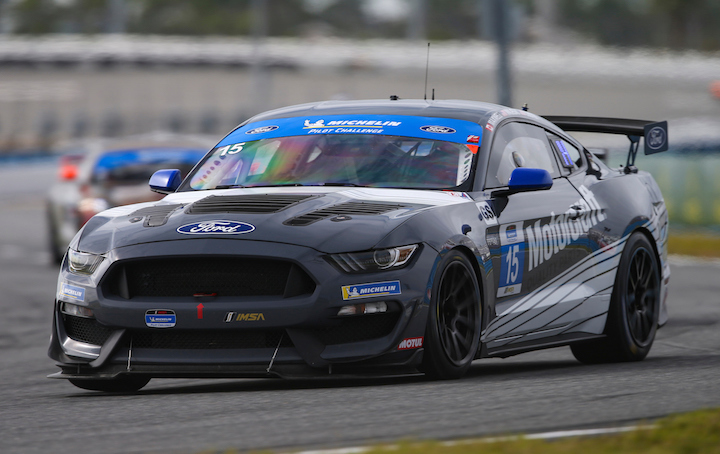 22 Ford Mustang GT4s of Multimatic Motorsports emerged from the 4-hour BMW Endurance Challenge at Daytona with a top five and a top ten finish, surviving a race of high attrition to bring home a solid points haul for the Ford Performance team. The No. 15 Mustang of Cole Custer, Ty Majeski and Scott Maxwell ran near the front of the GT4 pack for the first part of the day after starting the race from fourth on the grid, but began to fall through the order after the first hour. Meanwhile the No. 22 car, piloted by Billy Johnson, Austin Cindric and Chase Briscoe, was working its way through the order after starting way back in 16th and eventually caught passed the sister Ford car. As the race wore on, it became clear that the McLaren GT4 was the car to beat, with the pole-sitting No. 75 Compass Racing McLaren GT4 of Paul Holton and Kuno Wittmer slicing its way back through the order after a difficult pair of opening stints and engaging in a thrilling battle with the No. 69 Motorsports In Action car of Jesse Lazare and Corey Fergus. The No. 99 Automatic Racing Aston Martin GT4 and the No. 39 CarBahn Motorsports Audi R8 GT4, the latter of which was also quick all day, also proved to have race-winning pace and eventually made for a thrilling four-way battle for the lead. The No. 22 Mustang was now sitting a rather distant fifth behind the four-car lead pack before a yellow came out for a multi-car crash with about 15 minutes to go, prompting a frenzied, late-race dash for the finish. The No. 22 survived the carnage to come home fifth, while the No. 15 recovered from a difficult day and crossed the finish line in ninth. The race was won by the No. 75 McLaren, which managed to pull away from the pack following the restart, with the No. 99 Aston Martin and No. 69 McLaren rounding out the podium in second and third, respectively. Click here for full provisional results rom the 2019 BMW Endurance Challenge at Daytona.